The President of the African Development Bank, Akinwumi Adesina, has made a compelling case for accelerating Africa's industrialization in order to create jobs, reduce poverty and promote inclusive economic growth. Citing data from the Bank's 2018 African Economic Outlook launched in Abidjan, Côte d'Ivoire, on Wednesday, Adesina said infrastructure projects were among the most profitable investments any society can make as they "significantly contribute to, propel, and sustain a country's economic growth. Infrastructure, when well managed, provides the financial resources to do everything else." 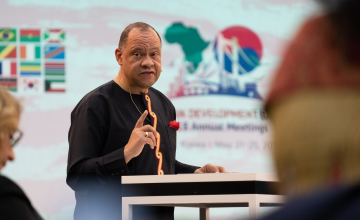 Noting that economic diversification is key to resolving many of the continent's difficulties, he urged African governments to encourage a shift toward labour-intensive industries, especially in rural areas where 70 percent of the continent's population resides. "Agriculture must be at the forefront of Africa's industrialization," he said, adding that integrated power and adequate transport infrastructure would facilitate economic integration, support agricultural value chain development and economies of scale which drive industrialization. He reminded the audience of policy-makers and members of the diplomatic corps in Côte d'Ivoire that economic diversification via industrialization with tangible investment in human capital will enable the continent's rapidly growing youth population to successfully transition to productive technology-based sectors. Adesina also highlighted the relatively unknown win-win situation that Africa's industrialization can generate within the developed world, citing data from the report, which notes that "increasing the share of manufacturing in GDP in Africa (and other Less Developing Countries) could boost investment in the G20 by about US $485 billion and household consumption by about US $1.4 trillion." New infrastructure financing gap estimates and innovative ways through which African countries can raise funds for infrastructure development are among the highlights of the 2018 edition of the report, which was launched at the Bank's headquarters for the first time in the publication's 15-year history. The Africa Economic Outlook was first published in 2003 and launched mostly in various African capitals outside the Bank's headquarters in May each year. In his remarks, Célestin Monga, the Bank's Chief Economist and Vice-President for Economic Governance and Knowledge Management, said the African Economic Outlook has become the flagship report for the African Development Bank, providing data and reference material on Africa's development that are of interest to researchers, investors, civil society organizations, development partners and the media. This year's edition focuses on macroeconomic development and structural changes in Africa, and outlines economic prospects for 2018. The report emphasizes the need to develop Africa's infrastructure, and recommends new strategies and innovative financing instruments for countries to consider, depending on levels of development and specific circumstances. Abebe Shimeles, Acting Director, Macroeconomic Policy, Forecasting and Research, said the Bank will publish Regional Economic Outlooks for Africa's five sub-regions. The self-contained, independent reports, to be released at the Bank's Annual Meetings in May 2018, will focus on priority areas of concern for each sub-region and provide analysis of the economic and social landscape, among other key issues. Participants at the launch session, moderated by the Bank's Director of Communications and External Relations, Victor Oladokun, included members of the diplomatic community in Côte d'Ivoire, representatives of international organisations and multilateral development banks, civil society and the media.